SHARMINI PERIES: It’s The Real News Network. I’m Sharmini Peries coming to you from Baltimore. 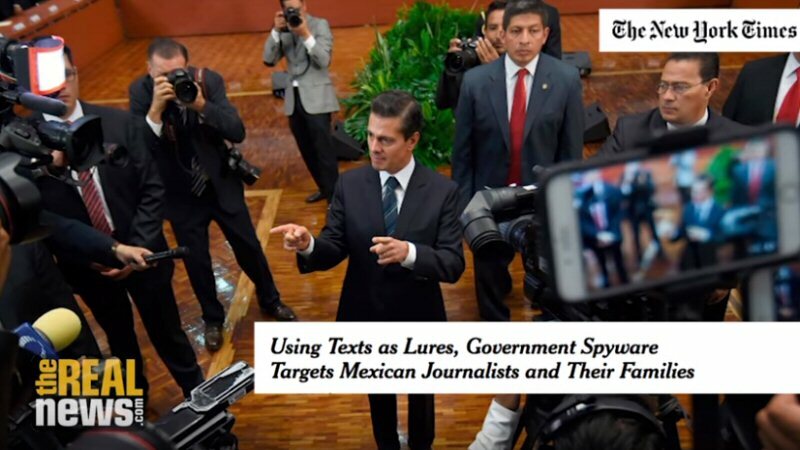 A new report in the New York Times reveals that Mexican government probably used software to bait human rights lawyers and journalists with texts on their phone in order to surveil them. The report is based on extensive study conducted by Citizen Lab, a Canadian research center on human rights information and communications technology and global security. The software to do this comes from an Israeli company, NSO. The Pegasus software package developed by NSO was used to hack into iPhones.Among the journalists and lawyers affected were anti-corruption lawyers, activists, as well as journalists and people investigating the disappearance of the 43 Mexican students in 2014. The government of Mexico is now facing massive criticism from journalists for having used this software, which is supposed to be used only for investigations of criminal suspects. According to several human rights groups, Mexico is one of the most dangerous countries in the world for journalists as is, with at least 125 killed or disappeared since 2000.On to talk about this with me is Shir Hever and John Ackerman. John Ackerman is a professor at the National Autonomous University of Mexico. He is also Editor in Chief of the Mexican Law Review, and a Columnist with both La Jornada newspaper and Proceso magazine. Thanks for joining us, John. JOHN ACKERMAN: Thank you, [inaudible 00:01:56]. Pleasure always. SHARMINI PERIES: Shir Hever is a Real News Network correspondent, covering the Middle East and more, stationed in Heidelberg, Germany. Thanks for joining us, Shir. SHARMINI PERIES: John, let me start with you. Carlos Loret de Mola, a news anchor with the Televisa is one of the alleged targets of the surveillance software. He claimed that the Mexican government is on the defensive. Explain why the administration of President Enrique Peña Nieto is so threatened by human rights lawyers and activists, journalists, investigations, and why are they spying on them? JOHN ACKERMAN: Well, this goes back last years. Unfortunately this is not new news, and Enrique Peña Nieto, when he was candidate for the presidency in 2012, hired a Colombian hacker to hack into the computers and the communication systems of his adversary, [inaudible 00:02:52], and his entire team. Previously Felipe Calderón, president, purchased very expensive programs from for instance Italy, from the United States itself. The United States has been very supportive of the increasing of the intelligence capacity of the Mexican state, but this has been used for a long time to spy on journalists, activists, and this new story in New York Times is very important because it puts the things much more clearly for the international audience.I myself as a journalist, I’m absolutely sure that my phone is hacked. We’re used to this. What we have here is a transition from the already authoritarian Mexican political system to what we could call a totalitarian system. Apparently it’s not enough for them to just beat up kids during the marches, censor the media, steal elections. There was a fraud recently, June 4th, in the state of Mexico, the most important state in Mexico, but they also want to get into the private lives. They want total control over the system, so this is very worrisome, and Enrique Peña Nieto, his approval ratings are the lowest they’ve been for any Mexican president in recent history. They’re down to 15-18%, so he’s desperate and he’s trying to control the country however he can. This is a dangerous scenario for us. SHARMINI PERIES: John, how did Mexico become among the countries in the world that is dangerous for journalists? JOHN ACKERMAN: Well, we have an impunity rate which is perhaps number one in the world. Only one out of every 100 crimes are ever punished in Mexico. Part of this is, of course, because the citizens don’t trust, as they’re not trustworthy, these attorney generals and the people who are supposed to investigate the crimes. Only 9% of the crimes are even reported to authorities, and out of those, only 1 in 10 approximately ever reach conviction. Violence is out of control and we get of course the drug money from the United States, the weapons from the United States, a collapse of democracy in Mexico, so we have a very dangerous situation which is creating lots of violence and a government which it’s very hard to tell on what side they’re on.Are they on the side of the people or of the narcos? This kind of spying activities makes us think the Mexican government is not defending civil society but actually participating in the attack on civic society. SHARMINI PERIES: Now Shir, seeking the technology to surveil on dissenters, or even to silence them, why would the Mexican government seek out an Israeli company in particular? Is it just the Israeli company, NSO Group, happened to have the best product for the Mexican government? Or, is there anything else motivating this factor? SHIR HEVER: Israel and Mexico were having military relations or many years. In fact, large arms companies were sometimes reluctant to sell weapons to the Mexican government directly, if those weapons were at risk of being used against civilians. But according to a newly declassified documents that an Israeli lawyer has shared with me recently, regarding 1994, weapon transfers from Israel to Mexico, including attack helicopters and so on, we can see evidence of what has been suspected for a long time, that Israeli companies, israeli weapon companies were willing to go a step further.When we’re talking about NSO Technology Group, this is a company that is not presenting itself as a military company, but in every way it is in fact a military company. It was started by military officers. Now, NSO has been also criticized for violating the privacy of people, especially after last year’s scandal where the company boasted that they’ve managed to hack the iPhone of a human right activist from the United Arab Emirates, and they boasted it in order to boost their sales to say that they have that technology. At that moment, Apple, the producer of the iPhones, said that they believe that such a hacking procedure is only possible by governments, not by corporations.It requires a government level resource in order to do this kind of hacking and in this case, according to the New York Times report, and according to the study of Citizen Lab, it seems that indeed this Pegasus software package has been used in Mexico and that makes this connection to this Israeli company. What the Mexican government sees in an Israeli company that develops this kind of technology is that not only do they have this prestige of the Israeli military, especially the Israeli intelligence forces, but also the company can say, “We are actually former Israeli military intelligence officers, and we have tested this technology,” We’re talking about state technology, state military technology, “Against actual human beings in Palestine, and so this is already tested.” That gives them an advantage over other countries. SHARMINI PERIES: Shir, how does this technology work? I understand you looked into the Citizen Lab report more specifically, but how do they use it to track journalists and lawyers and others? SHIR HEVER: Well, from the point of view of the person with the phone, they get an SMS message which is specifically tailored to their personal lives in a certain way. Mentioning a close family member or mentioning an issue that is very close to that person’s interest. In the case of human rights lawyers, or journalists, this is often some text message related to what they’re working on. But the text message appears to be incomplete and there is a link at the end of it for further reading. The person would be baited into following the link, then they get to some kind of broken page or something and at that moment, their phone has been hacked and their private information is reached the government.Now, what is interesting in this case is that this very unit from which the founders of NSO Group Technology come, it’s called 8200. This is an Israeli intelligence unit, and actually one of the largest units in the Israeli military, and in 2014, 43 officers of that unit refused to continue to serve in that unit, and they published a protest letter. I should say the number 43 by complete coincidence is also the number of disappeared students in Mexico but there is no connection. These officers wrote in this letter, some of them procedures that the unit 8200 is using in order to bait Palestinians by referring to private information about their families, about their personal life, in order to make them into collaborators or in order to force them to reveal private information. In fact, we see now the very same methods, the very same procedures used in Mexico as well. JOHN ACKERMAN: The Israeli connection is very interesting because just looking up here on January 28th, 2017, right after Donald Trump arrived at the White House and confirmed his commitment to build the wall between Mexico and the United States, the Prime Minister of Israeli, Netanyahu, tweeted the following: “President Trump is right. I built a wall along Israel’s Southern border. It stopped all illegal immigration. Great success, great idea,” and then flags of Israeli and the United States, so it’s quite symbolic, the participation of Israel in this effort, it confirms the idea among the Mexican people that we are being considered by the United States government as the equivalent of the Palestinians for the Israelis. We are an enemy occupying force and they are willing to do everything against us.Of course, here this particularly sinister part of it is that not just the United States government, but the Mexican government itself working with the United States government against the Mexican people. Just to bring in that more global comparison. SHARMINI PERIES: John, I’m glad you said that about the wall and the involvement between Israeli, the United States, and building of the wall over Mexico. Important point, but if you could further that by explaining what the political motivations here are? I mean, initially you had tension between Trump and the President of Mexico, Nieto, by what appeared to be the Mexican President canceling a meeting with Trump. It led to a lot of hype over the wall where Nieto had said he will not pay for the wall between Mexico and the United States, and yet, politically they seem to be in jive with each other. What do you make of that? JOHN ACKERMAN: Yeah, well Peña Nieto is the equivalent of Trump in Mexico. He has the same kinds of policies and anti-Mexican policies, anti-migrant policies. Peña Nieto has been beefing up the policing of the Southern border with Guatemala, he’s been inviting in the Trump administration to militarize the Southern border. He has been advancing the privatization of resources to hand them over to the United States. Mexico’s a vassal state under his leadership. He is an employee of Trump. He participated directly in the presidential election campaign by inviting Trump down in August, which gave Trump a platform to pretend as if he was having a statesman meeting with foreign leaders. It allowed Trump to make him pretend as if he was a friend of Mexicans and Mexico, although he was calling them rapists simultaneously.It’s not correct actually that Peña Nieto canceled the meeting he had scheduled with Trump. It was Trump that canceled it. He said that he was going to meet with Peña Nieto if Peña Nieto accepted to pay for the wall. That would have meant the end of the Peña Nieto presidency, he would have been kicked out immediately by his own people, so he stepped back, but it wasn’t actually a dignified position on the part of Peña Nieto. He wasn’t willing to be caught in such a overt way by Trump. We have an alliance between the Mexican government and the Trump administration against the Mexican people.That’s what’s so sad and desperate and sinister about what we’re living today in Mexico, that we have nobody that protects us. Only civil society, and look, we’re being massacred and spied on systematically in Mexico. Mexico is the, by far, the country in Latin America which most violates human rights. We have more political prisoners than anybody else in the entire region, more censorship, more violation of human rights, so that’s why it’s so important for there to be international intention. This New York Times article, and this story that we’re doing with you guys is very, very important. SHARMINI PERIES: Shir, this company NSO Group Technologies, which sells the Pegasus software package with the ability to hack into phones, what can you tell us about them? How is this kind of hacking different from say the ads we get after we had a conversation or we email something and they pick up some of the word, language, or somebody’s name in it? SHIR HEVER: Yeah, so the NSO Group Technologies was a rather small and anonymous company until they made a deal with the FBI. If you remember back in February 2016, last year, the FBI and Apple went head to head over the FBI demand that Apple will give them access to a backdoor that will allow them to hack into the phone in order to get information out of a phone for their investigation. Apple refused to do so. After a while, the FBI said, “We don’t need it actually anymore, we don’t need your help anymore because we can use this hack.” Now there’s a competition between the NSO Group Technologies and Apple. Apple is trying to keep up with the hacking by creating patches, security patches to protect the phones, but I think the main issue here is how is this company even allowed to continue to operate like this?The reason that the company is still legal, even though what they’re doing could certainly be considered developing a tool for a very invasive violation of people’s privacy, is that the company continues to insist that they have the permission of the Israeli Minister of Defense to sell their technology as long as they only sell it to governments, and they only sell it for the purpose of counter-terrorism. First of all in this case, we’re talking about the Mexico government. We don’t have authorization from the Mexico government that they have purchased specifically the Pegasus system, but we have from the NSO Group, the confirmation that their first customer is the government of Mexico.That makes a very strong case that indeed this is the technology that is being used, but of course, now that we see the result of the study by Citizen Lab, we see that the Mexican government has chosen to use this technology not against terrorism, but against human rights activists, lawyers and journalists. Now we would expect a kind of accountability process where in fact we would expect NSO Group to be accountable for selling their technology not for the purpose that they promised, as it is advertised. I think the difference between what you’re describing when you say you get some kind of strange message on your phone with a link that leads you to the wrong site, this can also be just a malicious advertising program by a private company.The problem is when governments use intelligence capabilities and resources and gather information on people that allows in that message already private information about you, so when you get this message in your phone, it already talks about something that’s very close to you. In the case of one of the human rights, a journalist that have been targeted by the Mexican government, for example her son was mentioned in the message, and they were trying to scare her by saying that they know private information about him. Of course, that crosses a very red line. SHARMINI PERIES: All right. John, let me give you the last word on this. JOHN ACKERMAN: Well, this is a very serious situation. What Enrique Peña Nieto, Mexican President, said yesterday in response to widespread indignation and questioning of [inaudible 00:18:37], he said, “Well, I get spied on as well. I’m just careful what I have to say when I’m on the phone, so don’t worry about it.” On the other hand he said, “Well, the citizens who have been spied on, it’s not the government, should bring their complaints to the Attorney General’s Office,” which of course is the institution of being accused of spying on them, for the Attorney General to investigate. Basically, he’s just backing up, denying the Mexican government is doing any of this, and refusing to investigate.This is just incredibly dangerous and the worst thing is that he counts on the full support of the Trump administration. His Foreign Minister, Luis Videgaray, was just in Cancun sitting side by side with Almagro to try to push through these new resolutions against Venezuela. They failed, they only got 20 out of the 23 I think votes they needed, but you know, Mexico is really playing a terrible role representing imperial interests in Latin America, and they’re getting paid back for that from the US government through total impunity. It’s very important for the international community to pay attention to what’s really happening in Mexico and not buy the hype. SHARMINI PERIES: All right. John, Shir, I thank you both for joining us today. Also from TRNN: Norman Finkelstein: Six-Day War, 50-Year Occupation — What Really Happened in June 1967?